Climate change is serious business in Charleston, South Carolina, and it's one reason budget cuts to scientific research have people taking to the streets. Time for another stop on our March for Science coverage. If you would like to add your voice to this growing chorus and tell us why you are marching, contact us at editors@sciencenode.org. Next up: Charleston, South Carolina! Britney Quimby has watched flooding get worse and worse in Charleston over the years. Many people now avoid going downtown when it rains, especially during high tide, says Quimby, a 31 year-old stay-at-home mom born and raised in Charleston. Storms with increased flooding are more frequent, and South Carolina’s coast suffered serious flooding from 27” of rain over six days in October 2015 and again from Hurricane Matthew in October 2016. If sea levels in Charleston rise four feet, as is projected over the next 100 years, 800 square miles of South Carolina coast will be underwater at high tide. When she saw that there would be a March for Science in Washington, D.C. on April 22, Quimby knew she wanted to organize the Charleston March for Science. She started a Facebook page that soon grew to almost 800 people. Others have their own reasons to participate. Bonnie Cleaveland, one of the organizers of Charleston’s march, took a sign advertising the march to South Carolina Senator Tim Scott’s February 25th town hall. She asked people to write on the sign why science is important to them. Cleaveland noticed that, although their attitudes toward science were extremely positive, most had difficulty articulating exactly what science does for us. Others responses indicated that they believe public policy should be based on science and that science uncovers truth. It’s clear that the public values science, but they may need more specific messages about exactly how science – and federal science funding and policy – affects them. The Trump administration’s proposed 2018 budget cuts about 20 percent from the National Institutes of Health budget, slashes 31 percent of the Environmental Protection Agency budget, and decreases the Health and Human Services budget by 18 percent. The National Oceanic and Atmospheric Administration would be cut by 18 percent. The proposed budget removes virtually all funding for climate change and clean power initiatives. Science is essential to all of us. Deleting data, cutting funding, and gagging scientists damages all of humanity. We could feel the effects for generations as scientists leave government jobs, academics do less research, and no one is there to train the next generation of scientists. At the march, participants will contact their legislators via social media to show off their pro-science signs. March organizers are providing pre-stamped and pre-addressed postcards to South Carolina senators and representatives. It’s clear that the public values science, but they may need more specific messages about exactly how science – and federal science funding and policy – affects them. Organizers have collected emails of people interested in the march and have created Twitter, Instagram, and Facebook accounts to communicate with followers. They’ve also recruited scientists who are willing to talk to the media. After the march, the organizers can help connect scientists with legislators and with the media. Join the Charleston March for Science at 1:00 PM on April 22. The march begins at Marion Square, Four Corners of Law, and the Visitors Center and follows the sidewalks down to Liberty Square at the South Carolina Aquarium for a 2:00 PM non-partisan rally. 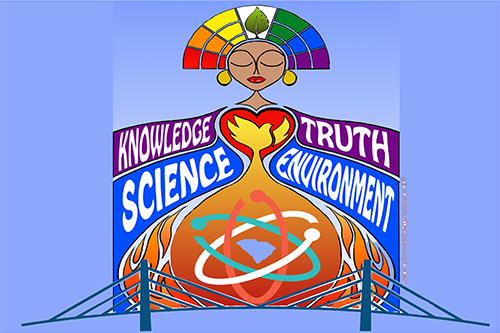 Science matters, and our planet's future depends on unhibited scientific inquiry. Want to read more of our March for Science coverage?